"It's nice to know the PCL recognizes all the hard work we put in to maintaining the field at Isotopes Park," Belau said. "Being able to work with the likes of Davin Sandia, Ryan Coleman and Darren Pedro makes my job easier and we would not have been able to win this commendation without their hard work." Belau is in his sixth season with the Isotopes but first in his current role as Head Groundskeeper. Originally from Wisconsin, Belau made the uncommon transition from a career as a musician to a life in baseball in 2012 when he began working on the grounds crew at the Cactus League's Peoria Sports Complex in Arizona. 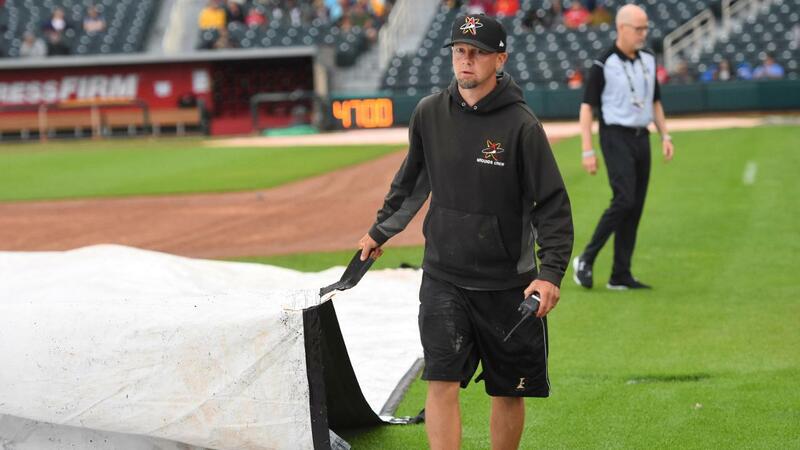 Clint joined the Isotopes organization in 2013 as a stadium operations assistant before moving to the grounds crew in 2014, working under long-time Head Groundskeeper Casey Griffin. "This recognition speaks volumes to Clint's talent and dedication," Isotopes General Manager John Traub said. "Clint, Ryan, Davin and Darren, in addition to the game-day employees, should all feel a tremendous amount of pride with this distinction. The playing field is such a big part of who we are and is a great representation of our organization." This is just the latest award for the highly-decorated Isotopes Park grounds crew, having previously won PCL Groundskeeper of the Year in 2007, 2008, 2014 and 2016, as well as the Triple-A award in 2008 and 2016, Professional Field of the Year in 2007 and 2013, Collegiate Field of the Year in 2004 and multiple other PCL Presidential Commendations.